The Hamilton laboratory studies epithelial cells in the intestine and colon and the roles they play in maintaining human health. Epithelial cells line the gastrointestinal tract and form a barrier between the external environment and the rest of the body. While we understand a great deal about the function of gastrointestinal epithelial cells, there is still much to learn about how they behave during stress or disease states. Our work will identify new mechanisms directly relevant to regenerative medicine, inflammatory bowel disease, and colorectal cancer. Our laboratory is dedicated to basic science discovery and applying our findings to human health and disease. We are committed to training the next generation of the scientific workforce and foster a diverse and inclusive environment. 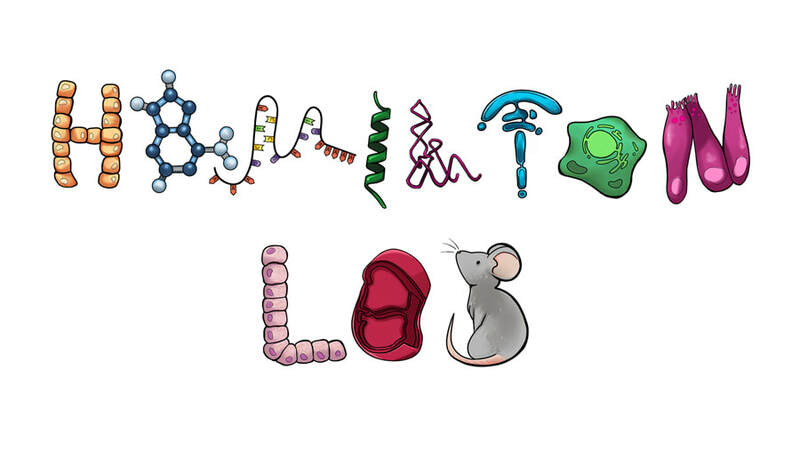 The Hamilton laboratory is grateful to our funding sources: National Institutes of Health (NIH)/National Institute of Diabetes and Digestive and Kidney Diseases (NIDDK): K01 DK100485, R03 DK100485, P30DK050306 and its pilot grant programs; the Crohn’s and Colitis Foundation Career Development Award program; the University of Pennsylvania Institute for Translational Medicine (ITMAT); and the Children's Hospital of Philadelphia (CHOP) Research Institute Development Funds. Banner graphic designed by Arwa Abbas. If you would like to support research in the Hamilton lab, please contact Dr. Hamilton via the Contact tab and she can direct you to Children's Hospital of Philadelphia Gastroenterology Division's Development Office.